Certainly design elements and technology platforms play a part in SEO and visitor visual appeal, as well as mobile and browser compatibility. Developing organic content and social media strategies are also key to any marketing strategy today. There are some general tips however, which should serve as a mantra for any company developing an approach to vehicle marketing services. In general – the fewer clicks a consumer needs to make in order to view relevant content – the better. 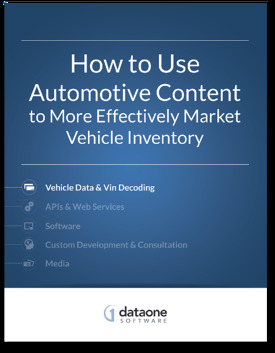 Some companies adhere to a strict rule of 2 clicks to navigate to the vehicle detail page; however the important aspect here is that the consumer is easily able to identify and quickly browse to information of interest. Consumer ability to compare vehicles is more important now than ever before. This is especially true since OEM’s are fiercely competing for market share with similarly classed vehicles. Consumers have more choices and points of comparison than ever before. Whether your goals are to provide more effective and highly performing dealer websites with integrated inventory, or unique and consumer friendly classified listings – the information provided in this white paper will hopefully aid in the development of enhancements that will set your solution or service apart from the rest to provide ultimate dealer and consumer benefit. Download the full white paper today!